City with best practice pesticide legislation. City where Parks and Gardens staff use integrated pest management. City where schools create and maintain kitchen garden programs and ‘Love Food? Love Bees!’ curriculum adopted by schools. City where there is clear and accurate labelling of ‘Bee Friendly’ plants which have not been treated with pesticides and promote bee friendly practices. City where street plantings are chosen for pollinator forage. City where pollinator corridors are created across the city through careful planting and individuals, businesses, institutions and community groups pledge to create pollinator safe habitat in their gardens..
Where the public are educated to minimize pesticide/ herbicide use. Please contact us if your business, school or community group would like to join us! 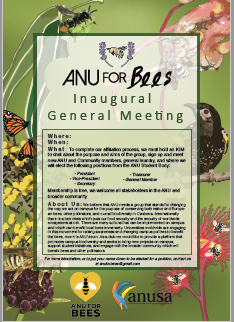 ACT for Bees partnerships: We are very excited that the first group to join us is ANU for Bees (Australian National University). 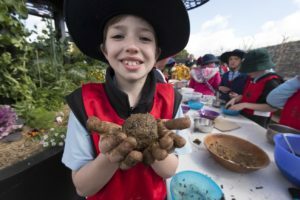 They got off to a busy start at the end of last year by planning and planting a pollinator friendly garden around the Canberra Environment Centre, thanks to a grant from the ACT Government. Stay tuned for more pollinator plantings on World Bee Day Sunday May 19th! Bee Curriculums for classrooms: We have partnered with ‘Cool Australia- Learn for Life’ to create an exciting ‘Love Food?Love Bees!‘ curriculums for Early Childhood, years 5/6 and High School as well. They can be downloaded from the Cool Australia website and taken straight into the classroom & also practically outside in the garden! We love the way Cool Australia curriculums are easy to use, focussed on sustainability and empower students to take action for the good of the world. Check out their very diverse curriculum materials through our website. 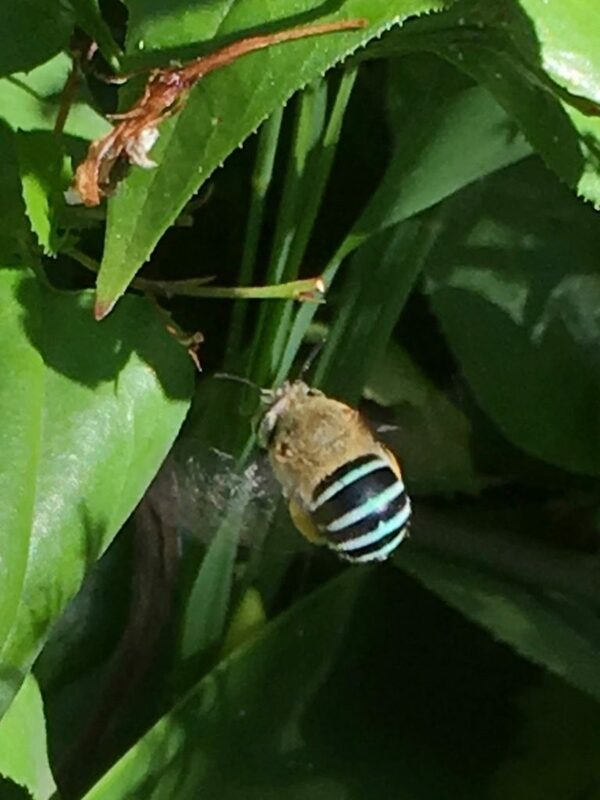 Pollinator Corridors in Housing Development: In 2016 ACT for Bees began an exciting new venture into a collaboration with Riverview Developers of the ‘Ginninderry’ development in West Belconnen to create a Pollinator Corridor in the streetscapes and green spaces throughout the development. Cormac Farrell, President of Beekeepers of ACT has been guiding us in which tree species are the best food sources for pollinators throughout the year. This project has also led to to the creation of ‘Plant Species for Pollinators’ which are additions to the ACT Urban Services Tree and plant species list which is used by Developers to plan the plantings in new suburbs. We have added the flowering times, the type of forage, whether it is nectar, pollen or seeds and the third aspect is the bees, butterflies or birds which use the plants for food. We are collaborating with Greening Australia and Canberra Birds Group to complete the information and look forward to its completion! 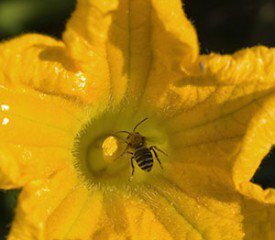 Pollinators are the foundation of biodiversity and their presence in landscapes creates food for a wide range of other animals. Australia is already one of the most urbanised countries in the world, with a predicted increase to 90% of the population living in cities by 2050. “Urbanisation is a major driver of ecosystem degradation and habitat loss and is a global threat to biodiversity.” (Australian Native Bees, 2016 NSW DPI p45) When land is cleared for urban development, many species lose their homes and food supplies. New developments are often ‘all house/ no garden’ and so there is an additional need for street plantings to provide a good range of food and habitat. By providing these resources in urban green spaces, native bees and other pollinators populations can be attracted and sustained, which in turn supports the biodiversity within urban landscapes. Many new developments also have sites for ‘Community Gardens’ which benefit from pollinator friendly plantings surrounding them. The structure of the floral resources is important as many native bees have limited flight ranges of up to 500 metres. By planting groups of similar flowering plants in clumps and providing overlapping flowering times throughout the year (particularly Summer flowering) there is more guarantee of a good source of nectar and pollen. A diverse range of flowers, particularly local natives is important. We have found that native plants tend to be less likely to be treated with pesticides, which is better for supporting a healthy ecosystem where there is a balance of pollinators and beneficial insects including ladybirds, butterflies, hoverflies and predatory wasps. Leaving areas of the ground undisturbed for nesting sites is also a factor in planning. ” From the start, our vision for Ginninderry has been to build a community of international significance, with innovation, diversity and ecological criteria at its core. Now we’re bringing this vision to life.” ACT for Bees appreciate the opportunity to be involved in this very large development which will take 40 years to complete. 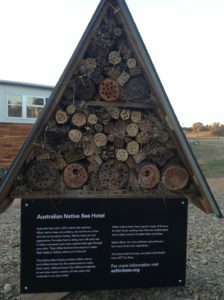 We’re excited as the beautiful big bee hotel ACT for Bees built for Floriade 2016 is now at the entrance to The Link at Ginninderry and has a number of local native bees moved in! This past month ACT for Bees has presented a number of ‘Bee Friendly Gardening’ , ‘Be a Bee Hero and ‘The beauty of Warre Hives’ sessions at the annual Floriade Festival. It’s been a valuable experience in bringing the ‘importance of bees’ message to a very diverse audience. Thanks to Peter Abbott who bought along a wide range of native bee hotels to show how to create bee habitat in our gardens and also Warren and RobWe’ve had a lot of positive feedback! Much appreciation to the ACT for Bees team who have worked so hard together to present these sessions. We were also having fun making ‘Seed Balls’ at the recent Nature Play Day at the Arboretum with a number of schools who joined in the fun. EDEN seeds Pollinator mix was the basis of the mud balls to plant in our gardens to attract beneficial pollinators and boost biodiversity. For the Beekeepers ACT Field Day in March we created a Pollination game for children to be bees. 2 species of apple trees were built and the ‘bees’ happily cross pollinated the trees and earned a delicious organic apple for their work. We will be at the Queanbeyan Primary Schools Gala Event October 21st 10-1 and the apple trees are in bloom and in need of more bees to ensure we have apples in the Autumn! 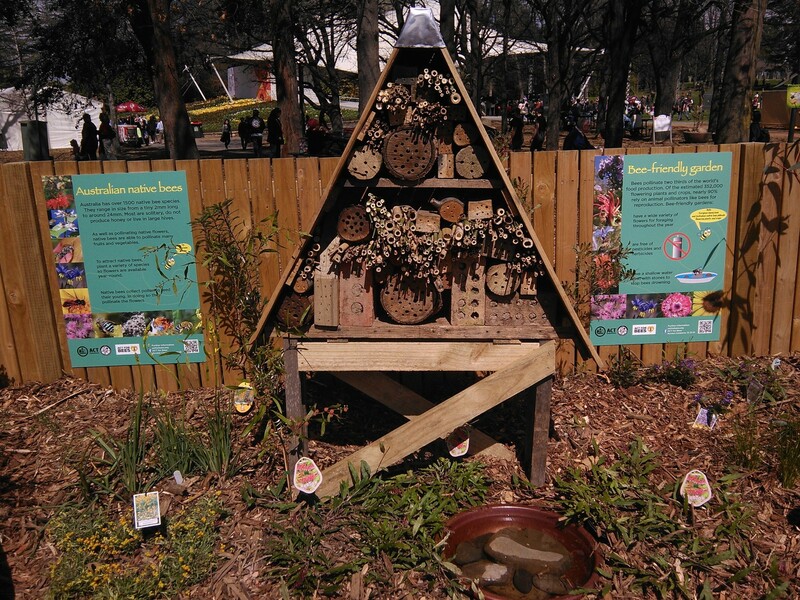 Partnered with ACT Govt at Bush Friendly Stall at 2016 Floriade and built a bee hotel for the stall. Attended Natural Beekeeping workshops with the Beekeepers of ACT Association. Built a Warre Hive with Warren for display at education stalls. 3rd year of ‘The Bee Friendly Plant Stall’ at The Orana Spring Fair, Weston (ACT) 2nd Sunday in November (13th November 2016). Appeared in ‘The Hungry Gardener‘ podcast speaking about the importance of bees for our world . Created a short puppet play on the importance of bees with students to present to ‘Kids Teaching Kids 2015 Week’ at the National Zoo & Aquarium. Our ‘ACT for Bees’ group visits markets, Festivals & Sustainability Conferences teaching about the importance of bees for pollination of our food and ways to be ‘Bee Friendly’. 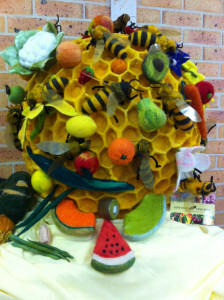 A Community Arts Project is showing how vital bees are for the pollination of a whopping 2/3 of our food production. Fruit and nuts including apples, almonds, avocados, cherries, kiwifruit, apricots, peanuts, blueberries, plums, mangos, oranges, peaches, pears, watermelon and honeydew melons. Vegetables and seeds including beans, broccoli, carrots,cucumbers, cauliflower, celery, onions, pumpkins, squash and sunflowers. Livestock feed including clover and lucerne all depend on honeybees for pollination. What is your favourite food on the Global Hive? 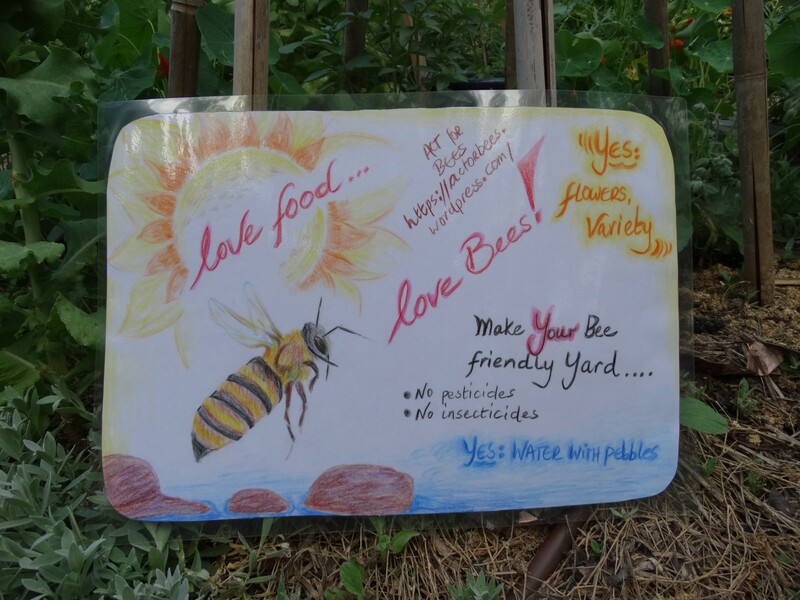 Make a Bee Friendly sign for your front garden to advertise how important bees are. We are very pleased that he bee hotel made for Floriade 2016 is now outside The Link Centre at Ginninderry development in Holt.